Uglyworld #698 - The Weekend Traveller, originally uploaded by www.bazpics.com. This weekend marked Trunko's first big adventure with me, and what a first adventure it was - the sheer size of Crater Lake is immense, and I have no idea how Trunko is ever going to be able to top this trip. "I really loves this trip we makes, it was awesomes, reallys, I can't waits for wherevers we visits nexts", he told me on the way home while chatting away about just how steep some of the cliffs were and how blue the water in the lake was. 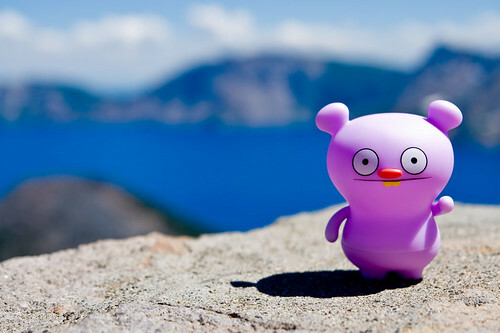 I just hope I'm able to find somewhere even half as amazing as Crater Lake to keep Trunko smiling.